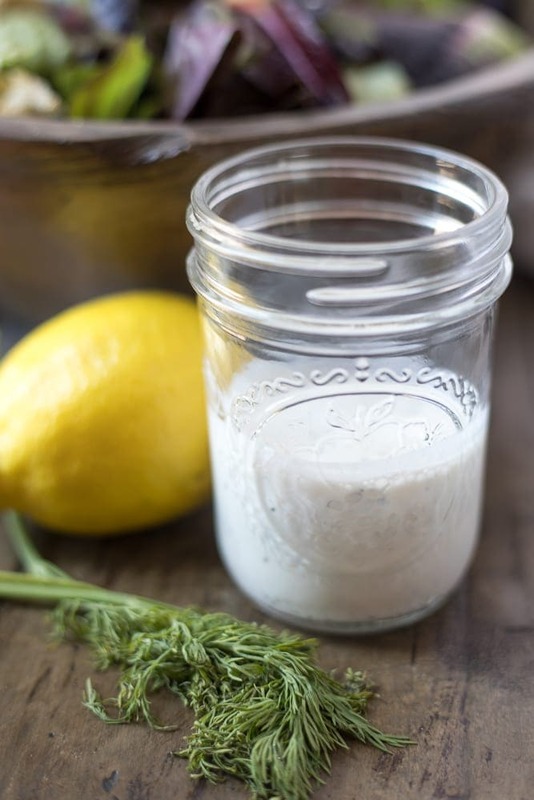 Homemade Ranch Dressing is so incredibly easy to make! From dipping veggies, to salads, to spicy dishes, you need this ranch dressing recipe in your life! We serve ranch dressing with Buffalo Chicken Pizza, Instant Pot Chicken Wings, tossed salads, and Buffalo Chicken Tacos. But if ranch dressing is not for you, check out Raspberry Vinaigrette, Balsamic Vinaigrette, or Poppy Seed Dressing. Are you obsessed with ranch? My husband and my kids use ranch dressing on EVERYTHING–from veggies, to salads, to wings, to even baked potatoes. Thankfully, I can easily whip up homemade ranch dressing that is not full of preservatives, MSG, or high in sodium–so they can pour away and enjoy their ranch dressing as often as their hearts desire. Making ranch dressing at home is not at all hard–especially when you start with a homemade ranch seasoning. The flavors of this homemade ranch are fresh and bright, but definitely mimic the beloved bottled dressing. I use Greek yogurt in place of mayonnaise for a homemade ranch that is lower in fat, egg free, and has a bit of protein. Plus I find the tang of Greek yogurt pairs nicely with the ranch flavoring, while the mayonnaise can overtake the flavor. But free free to use mayonnaise if you have it! 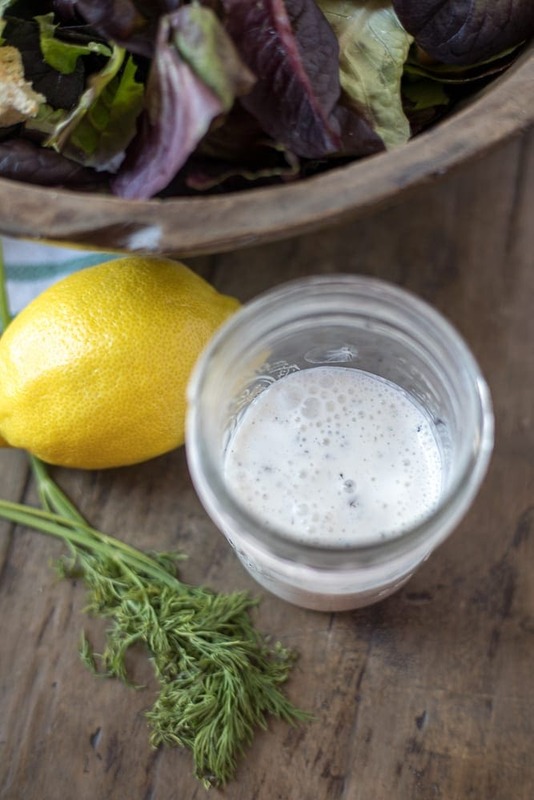 Ranch dressing is traditionally made with buttermilk, but because I add fresh lemon juice to this salad dressing, there is no need to use buttermilk unless you have it on hand. I recommend starting the process of making ranch by making ranch seasoning–then you can have it on hand whenever you want to whip up some homemade ranch dressing. Whisk together milk, sour cream, yogurt and lemon juice together until well combined. Add in spices, or 2 teaspoons ranch seasoning and whisk again. Place dressing in a air tight container and refrigerate for at least 30 minutes before using. Because of the dairy in ranch dressing, and the fact homemade dressing has no preservatives, homemade ranch will keep in air tight glass container in refrigerator for up to 1 week. Just be sure to shake well before each use. While salads are fabulous for ranch dressing, there are so many other uses and recipes Ranch Dressing pairs perfectly with. Homemade ranch salad dressing will keep in air tight glass container in refrigerator for up to 1 week. If you don't have fresh lemon juice, use apple cider or white distilled vinegar in it's place. Feel free to use mayonnaise in place of Greek yogurt if desired. I recommend starting the process of making ranch by making ranch seasoning--use 2 teaspoons of ranch seasoning in place of dried spices and salt and pepper. What a great idea to use Greek yogurt instead of mayo! This is my husband’s favorite salad dressing, but I’ve been lazy and have just buying a bottle at the grocery store. Your recipe was just what I needed. Perfect—so easy and Bill loved it! Oh I love hearing that your husband enjoyed!